Cylindrical Ribbon Blender is used for applications where vacuum or pressure or heating/cooling is required. Access is limited to small side access doors or top mounted manways. 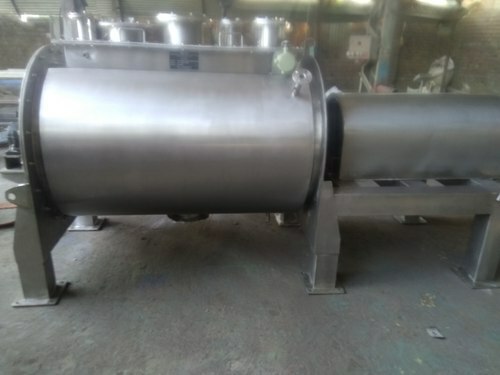 There is provision for application of vacuum inside the shell and circulation of heating media in the jacket during the rotation of the stirrer. The large heating surface area presented by the internals of the cylindrical shell ensures uniform drying of the product, as the product gently moving while the ribbon stirrer rotates. The diffusive action induced by the mixing stirrer constantly presents a fresh layer to come into contact with the indirectly heated walls of the shell. A well-designed sealing system enables maintenance of deep vacuum inside the shell, and also ensures positive circulation of a heating medium in the jacket.